At Symmetrical Group Pty Ltd our policy respectfully aligns ourselves with the universal declaration of human rights and we believe that our people are our most valuable resource and play a pivotal role in helping us realise our Vision. Symmetrical Group recognises that it is through the quality and application of our employees that we will achieve our success it is imperative that all personnel show a common goal of completing projects safely, on time and within the budget. Employ people sharing the common aims of Symmetrical Group. Acquiring, developing and retaining a pool of high-calibre talent. Enabling and empowering our employees to be creative and innovative. Establishing systems and practices for maintaining transparency, fairness and equity. Creating a culture of continuous learning, competitiveness and excellence through change management. Respecting ethics, values and good governance. We will protect our working environment from negative influences and uphold a healthy spirit with in the work place to ensure that all can achieve their professional goals. 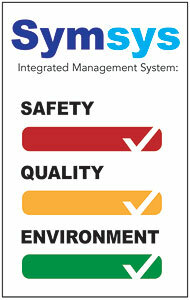 Symmetrical Group will implement and maintain these systems, inclusive of standards, policies and procedures. These processes will be monitored regularly to ensure their integrity and effectiveness to facilitate continuous improvement.